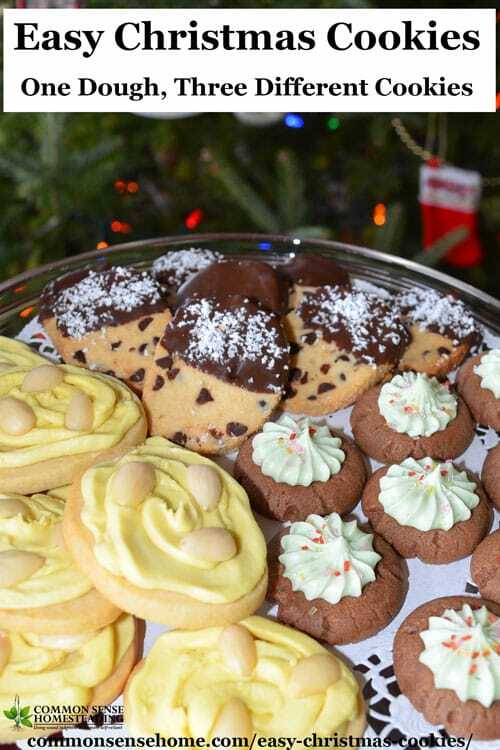 These easy Christmas cookies let you turn one batch of dough into three different cookies. Two of the recipes are sliced and one is rolled, making it easy to prep them for baking. (No cookie cutters needed!) 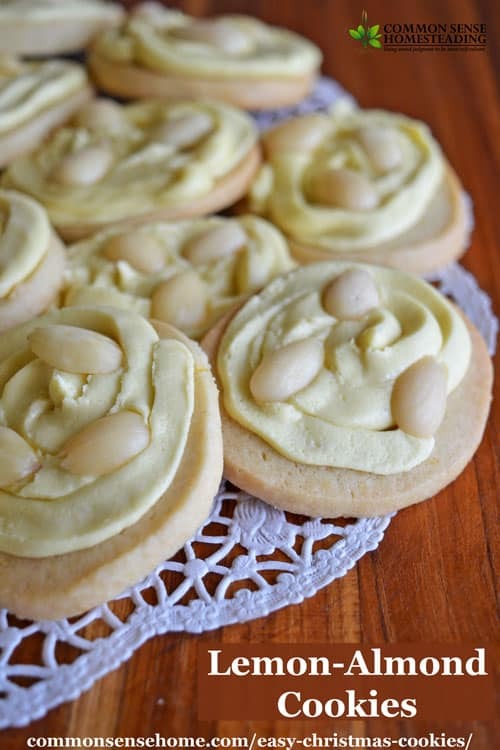 The basic dough makes lemon-almond cookies, chocolate-mint thumbprint cookies and chocolate freckle cookies. To make the cookies, start with a batch of Three Way Cookie Dough. Divide the dough into equal portions and add the special touches for each individual recipe. My teenage sons did most of the baking in preparation for sharing these on the website, so you know that the recipes aren't fussy. 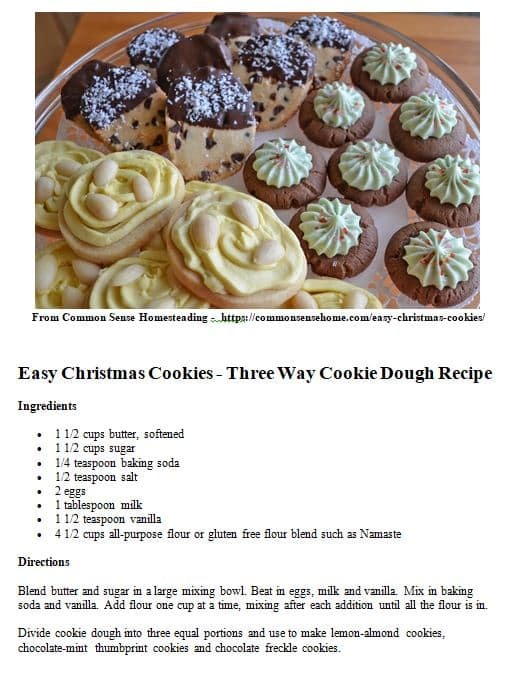 The recipes were adapted from the book Cookies for Christmas, but we changed them up a bit to use what we had on hand. For baking cookies like these, I like to use my Airbake cookie sheets. They make it easier to get the cookies just brown enough and not burned, even if you're a little late getting them out of the oven. For ease of printing, I put together all the recipes in a printable pdf, linked at the bottom of the post. Blend butter and sugar in a large mixing bowl. Beat in eggs, milk and vanilla. Mix in baking soda and vanilla. Add flour one cup at a time, mixing after each addition until all the flour is in. 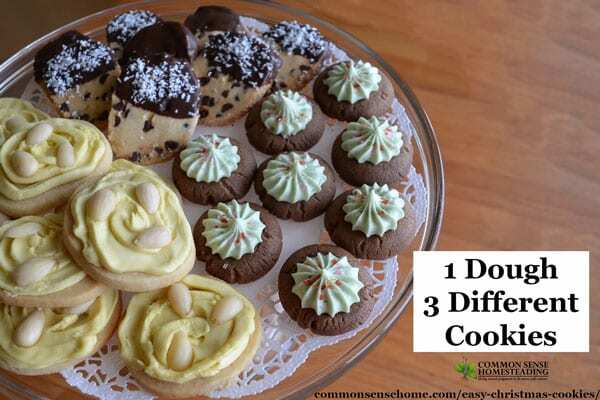 Divide cookie dough into three equal portions and use to make lemon-almond cookies, chocolate-mint thumbprint cookies and chocolate freckle cookies. What goes better with chocolate than more chocolate? Add the shredded coconut to dust your cookies with “snow”, and make sure to use unrefined coconut oil for more coconut flavor. For the coconut haters, use refined coconut oil or shortening to skip the coconut flavor and keep the chocolate plain. If you're in a hurry, you can skip dipping, but it really dresses up the cookies. Mix 3/4 cup mini chocolate chips into Three Way Cookie Dough until thoroughly combined. Cut cookie dough into 1/4 inch thick slices with a sharp knife. Places slices 2 inches apart on an ungreased cookie sheet. Bake at 375°F for 8 to 10 minutes, or until edges are firm and bottoms are lightly browned. (Airbake pans will take a couple minutes longer.) Transfer to wire rack to cool. To make the chocolate dip, melt 1/2 cup mini chocolate chips and coconut oil on the stove top or in a microwave safe container. Do not overheat, or your chocolate will get stiff. 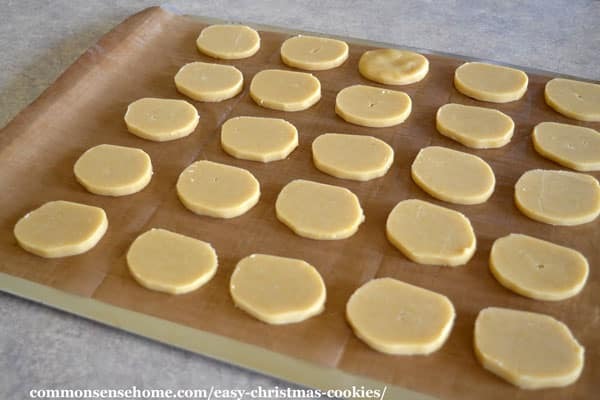 Dip cookies and place on wax paper or tray. 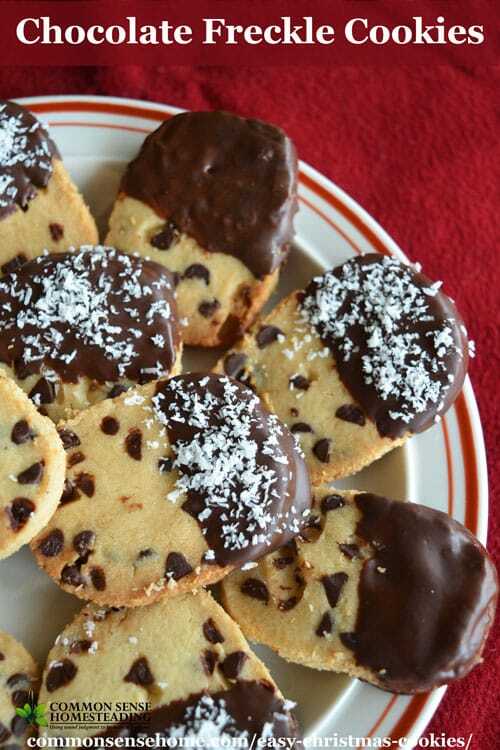 Sprinkle with coconut while chocolate coating is still soft. Allow coating to harden, then store in an airtight container for up to one week. 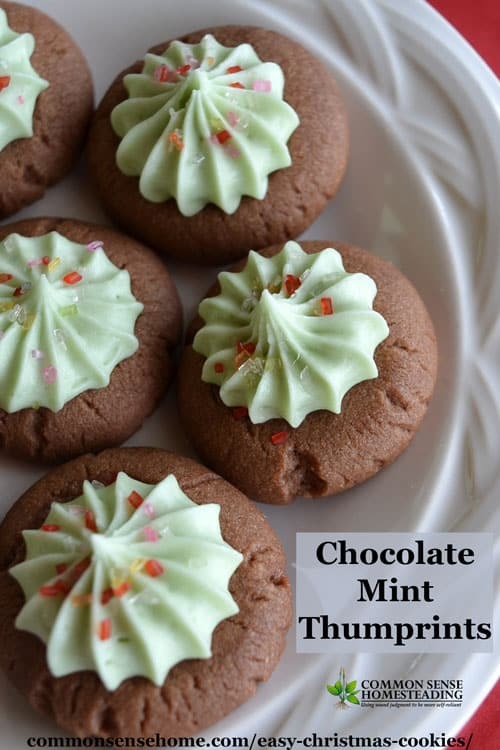 Cool and creamy mint filling teams up with soft chocolate cookies in this classic flavor combination. Combine cookie dough, chocolate and 2 teaspoons milk in a medium mixing bowl. Blend until well mixed. Shape dough into 8 inch long roll. Wrap in waxed paper and chill for about an hour. Cut cookie dough into 3/4 inch thick slices with a sharp knife. Cut each slice into quarters and roll each quarter into a ball. Place balls 2 inches apart on an ungreased cookie sheet. Press down the center of each ball with your thumb. 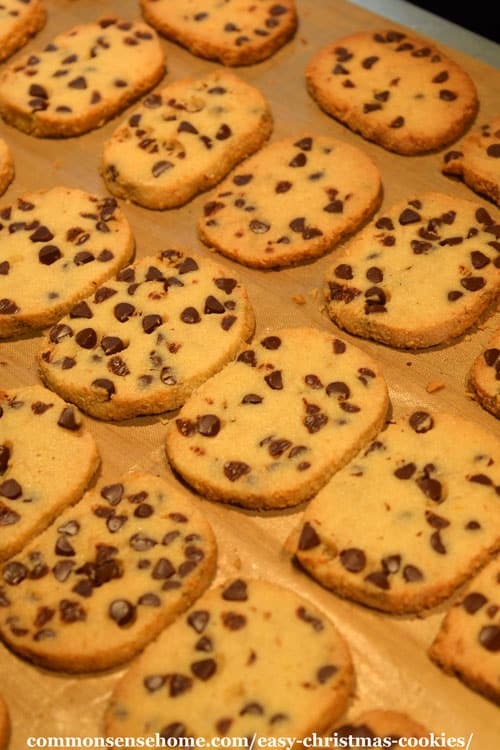 Bake cookies at 375°F for 8 to 10 minutes or until tops look dry. (Airbake pans will take a few minutes longer.) Transfer cookies to wire rack to cool. For peppermint filling: Cream butter in a medium bowl or electric mixer bowl. Gradually add powdered sugar, stirring until well combined. Beat in milk, peppermint extract and food coloring (if desired). Gradually beat in second cup of powdered sugar and mix until smooth. Spoon a scant teaspoon of peppermint filling into the center of each cookie (or pipe it in with a star tube and pastry bag). Top filling with sprinkles or crushed candy cane bits, if desired. Store in an airtight container. Combine the cookie dough, lemon peel and almond extract in a medium mixing bowl and stir until well combined. Shape dough in an 8 inch long roll and wrap in wax paper. Chill in the refrigerator for at least four hours (or overnight). 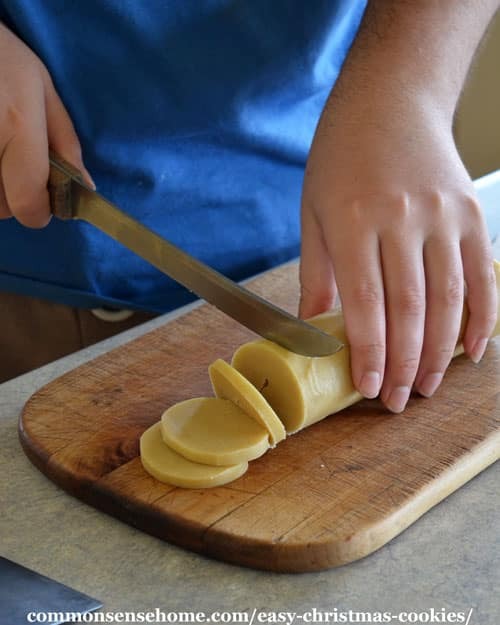 Cut dough into 1/4 inch slices using a sharp knife. Bake cookies at 375°F for 8 to 10 minutes, until edges are firm and bottoms are lightly browned (Airbake pans will take a few minutes longer). Transfer cookies to wire rack to cool. For lemon frosting: Cream butter in a medium bowl or electric mixer bowl. Gradually add powdered sugar, stirring until well combined. Beat in milk, lemon juice, vanilla, almond extract and food coloring (if desired). Gradually beat in second cup of powdered sugar and mix until smooth. Spread about 1 teaspoon of the frosting on each cookie (or pipe it on with a star tube and pastry bag). Sprinkle with sliced almonds or blanched almonds. Click here to print the recipes, or on the image below. Click on image above to print.